LED bulbs should be “put in use immediately ... 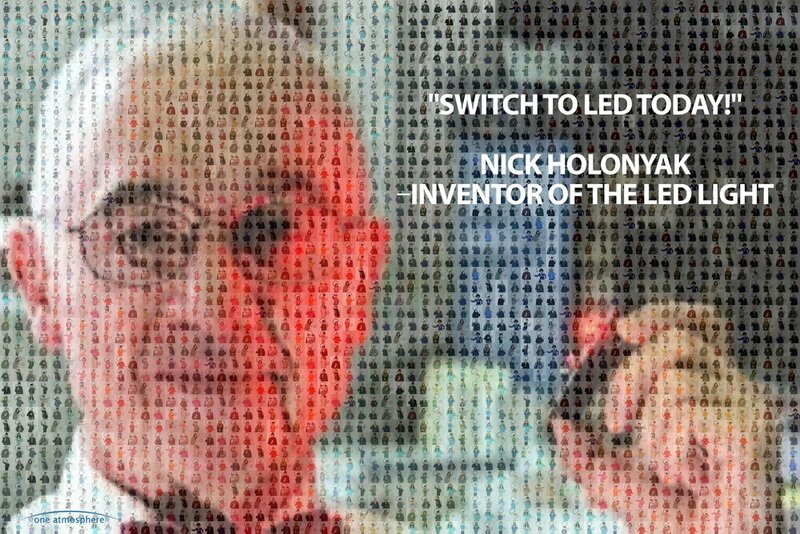 I urge you to continue with your program, and wish to thank you and congratulate you for what you have done already.” Nick Holonyak, inventor of the LED bulb, to One Atmosphere. To view high resolution copy of mosaic, click here. Say goodbye to those primitive, energy-wasting incandescent bulbs. With about 35% of U.S. carbon emissions coming from generating electricity, significantly reducing the demand for electricity can directly help our environment. According to the U.S. Department of Energy: "Widespread use of LED lighting has the greatest potential impact on energy savings in the United States. By 2027, widespread use of LEDs could save about 348 TWh (compared to no LED use) of electricity: This is the equivalent annual electrical output of 44 large electric power plants (1000 megawatts each), and a total savings of more than $30 billion at today's electricity prices." The good news is that we can easily get started on making this change now. A common misconception about LED bulbs is that they do not make economic sense, but prices have come down dramatically in recent times. At current prices, it only takes a matter of months for a typical LED light to pay for itself, if it is used for about 4 hours a day. Surprisingly, even though LED lights are now more affordable and can have a big impact on global warming, their use is still limited. As of 2015, 71% of U.S. homes had no LED bulbs and, according to a study by the Department of Energy, the U.S is only on track to have LEDs make up 28% of lights installed in residences by 2020. The idea behind Switch to LED Today! is to encourage folks to make the change sooner. In 2018, we partnered with the City of San Francisco Department of the Environment to help with the world's largest single LED light giveaway ever. As part of the project, we gave away LED bulbs to primarily low income children, families and seniors in neighborhood organizations, low-income housing, and schools. The Citywide giveaway program was a huge success, with anticipated savings of over $1 million for residents and an annual reduction of over 5,000 tons of carbon dioxide emissions. Kids at local community center showing off their new LED bulbs! We are also developing and putting on programming to educate kids about the environmental and financial benefits of switching to LEDs , so they can bring those lessons into their home and teach their families as well. Check out our latest handout on how LED lights can help in the fight against global warming! Want to help make a difference in your home or workplace? Then Switch to LED Today!